The earth brought forth vegetation: plants yielding seed of every kind, and trees of every kind bearing fruit with the seed in it. The Garden of St. Thérèse offers a “bit of earth” in the midst of an urban landscape, where parishioners and neighbors can meet, dig, sow, weed, and harvest together. Our goal is to create a beautiful place where people can see themselves as created by God, where they can feel safe, enlivened, and connected to God and to other people. In a neighborhood with limited access to fresh, organic produce, the garden offers witness to God’s love and providence as we learn to raise food, not only for ourselves, but for others in need. The Garden is a community project in the deepest sense—encouraging inter-personal and inter-generational connection, drawing on and extending the skills and gifts of those who participate, transforming ourselves, our parish and our community. We are growing more than just vegetables here! The “planters” in which our garden grows are discarded tires that members have gathered from around the neighborhood. In the early Spring, we assemble the neighborhood children to paint the tires before we fill them with dirt for planting. Laying down straw between the tires both suppresses weeds and provides us with a place to walk while we’re working! Our garden is a part of the Unity Gardens movement, which means that people can visit the garden, work in it, and harvest as they please. 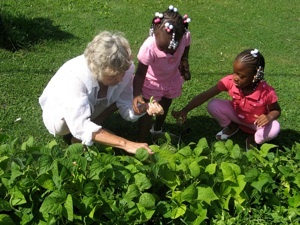 It also means that we share gardening classes and resources with other Unity Gardens across the city. There’s a lot going on, so be sure to visit the Unity Gardens website for more information. Donate materials like tools, plant stakes/cages, yard waste bags, string, etc. Teach us a new skill. Pray for the Garden of St. Thérèse and all whose lives are touched by it. Almighty God, we thank you for making the earth fruitful, so that it might produce what is needed for life: bless those who work in fields and gardens; give us seasonable weather; and grant that we may all share the fruits of the earth, rejoicing in your goodness; through Jesus Christ our Lord. Amen. The Church of the Holy Trinity has occupied the NW corner of Prast and Olive Streets on the west side of South Bend since 1949. Initially a new development for working-class families, the neighborhood around Holy Trinity experienced significant social and economic transition, becoming somewhat depressed and impoverished. Despite having an aging and declining population, the parish sought for many years to find ways to get to know its neighbors and minister with them. Our former Rector, Mother Tina, became known at the hospital as the “pastor at the church with the garden.” Through that connection we were able to minister to a neighborhood family who lost their father/husband to cancer. Our garden became a part of the Unity Gardens movement, meaning that people can visit the garden, work in it, and harvest as they please. Not only were our vegetables being eaten by parishioners and neighbors, but we also gave produce to the Food Pantry at Broadway Christian Church and to the Food Bank of Northern Indiana. Many people who were on limited incomes and too frail to work in the garden found that they could provide support and resources in other ways. One elderly neighbor gave us her organic gardening books to put in our library, a parishioner saved pantyhose for garden ties and yogurt containers for pots. Yet another visits unwell neighbors to spend time and to share veggies. 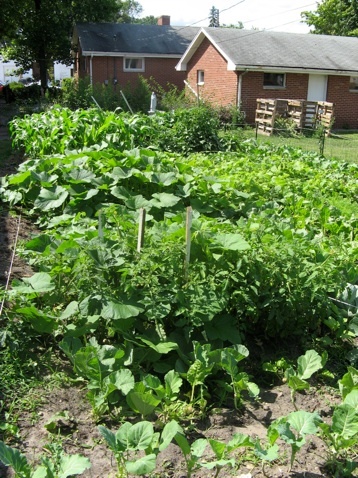 In recent years, management of the garden has changed hands as people come and go from the parish and the neighborhood. Through the change, we trust that Christ continues the work of preparing the soil, both in our garden and in our hearts.